Affligem Abbey was founded in the middle of the 11th century by a group of six "pillaging knights" who had reformed themselves into Benedictine monks. Brewing activities began as early as 1074 and the abbey was apparently intimately involved in the hop trade (apparently hops still grow near the monastery). History being what it is, the abbey's buildings were sacked several times over the centuries, and always rebuilt, though after it was destroyed during World War II, the monks decided to contract a local brewery to make their beer. 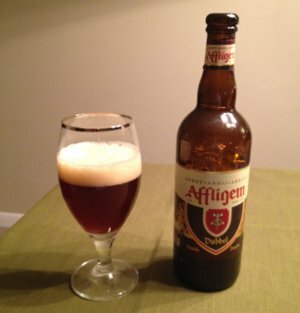 That brewery was eventually bought out by Heineken, but the monks retain the Affligem brand name and certain controls over their beer (and like the Trappists, they use their proceeds for charitable purposes). Beer Nerd Details: 7% ABV bottled (750 ml, caged and corked). Drank out of a goblet on 1/20/12. This beer does share a certain character with Ommegang's Abbey Ale, though this isn't quite as heavy. I remember picking up a bottle of this stuff in my fledgling beer nerd days when I knew nothing about beer. I picked it because it had a tasteful design and I knew I liked dubbels - not quite Belgian beer roulette, but pretty close. I remember being somewhat disappointed by their Tripel when I circled back on it, but it's something I'm going to need to revisit at some point. Collaboration beers are among the most weirdest things about the craft beer world. Rarely do you see competitors actively collaborate like this, but then I guess the fact that craft beer only really represents around 5% of the market generally means that they're not really competitors - their growth comes at the expense of the macros. Or something like that, I guess. 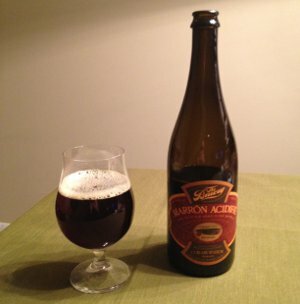 This one is a collaboration between The Bruery and Cigar City. If I'm not mistaken, both come from the craft beer class of 2008 and both enjoy a pretty solid reputation* amongst beer nerds. I've already sung the praises of The Bruery before, but Cigar City is new to me, and in a recent interview over at Beer Samizdat, I learn that their brewer has the awesomest name ever: Wayne Wambles. Amazing. 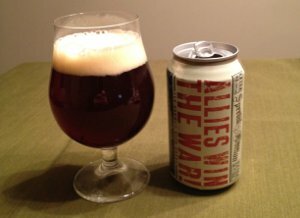 On The Bruery's website, they have a page for this beer that lists a lot of what I usually call the Beer Nerd Details in my reviews. Things like ABV, IBU, and SRM. But this one has an additional metric that I don't believe I've seen before. Apparently this beer has not 4, but 6 whole shizzles**. Beer Nerd Details: 8.5% ABV bottled (750 ml capped). Drank out of a tulip glass on 1/14/12. IBU: 15, SRM: 20, Schizzles: 6. This was released in the Spring, not making it's way to the East Coast until early Summer, though I didn't pick up my bottle until this past holiday season. It's bottle conditioned though, and the bottle sez it's suitable for aging up to 5 years. I guess what I'm saying is that I need to buy some more of these for my burgeoning beer cellar program. Also on my to-do list: get my hands on some more Cigar City beer. * And by "pretty solid" I man astronomical. ** Apparently besting a previous beer called "Four Shizzles", though records on that one are a bit sparse. Beer Nerd Details: 8% ABV bottled (11.2 oz.) Drank out of a goblet on 1/13/12. The cap has a date printed on it that says 07.10.14. Amazing stuff. I feel like I should have more to say about it, but nothing else is coming to mind. If you ever get the opportunity to try any Westvleteren beer, don't pass it up. I'm not going to go out of my way to try the Blonde, but perhaps I will luck into one at some point in my life. Or perhaps not. These are rare beers, after all! Earlier this week I reviewed a beer that I think had the best designed bottle (sorry, "ceramic crock") I've ever seen, but the packaging for the recent 21st Amendment collaboration with Ninkasi gives it a run for its money. 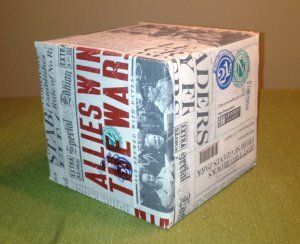 Indeed, all of 21st Amendment's beers have great packaging, making excellent use of the larger canvas provided by cans (and I love that they put their cans in boxes, even with four- or six-packs). Beer Nerd Details: 8.5% ABV canned (12 oz). Drank out of a tulip glass on 1/21/12. Over at Beervana, there's a nice pedantic discussion over what constitutes an West Coast IPA (an offshoot of a debate with Stone's Greg Koch). Truthfully, I've never quite understood the distinction myself, but I always assumed it had something to do with big, juicy American hops with all their fruit and pine characteristics. But reading those posts and the comments, it occurs to me that no one really knows and who really cares? Styles are like genres in that they're fuzzy around the edges and often bleed into one another. Styles can give you a broad idea of what you're in for, but maybe they don't need to be quite so granular or locked-down. Ok, everyone get that? 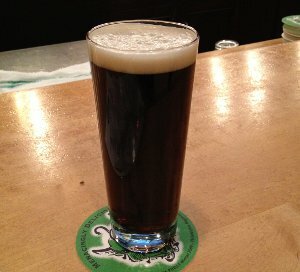 It's an English IPA born on the West Coast of North America, resulting in a red ale? 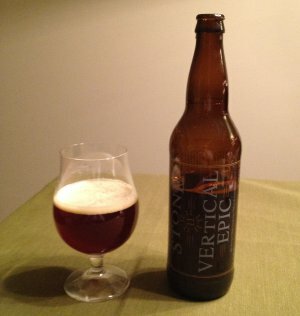 Beer Nerd Details: 6.5% ABV bottled (11.2 oz). Drank out of a tulip on 1/21/12. 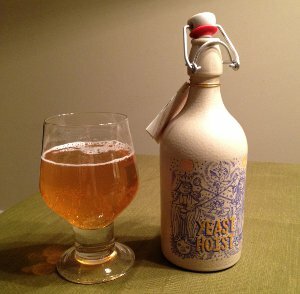 Beer Nerd Details: 7.7% ABV bottled (500 ml ceramic crock). Drank out of a goblet on 1/13/12. 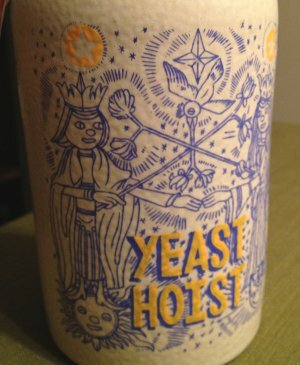 I'm pretty sure the Yeast Hoist bottles were a limited run, but the standard St. Sebastiaan Golden bottle is the same style ceramic crock thing, just with different artwork. It's apparently somewhat popular, so perhaps I just got a bad, under-carbonated bottle or something. I was going to write a beer review tonight, but since the web has apparently gone on strike, I figured I'd spend a little time talking about that instead. Many sites, including the likes of Wikipedia and Reddit, have instituted a complete blackout as part of a protest against two ill-conceived pieces of censorship legislation currently being considered by the U.S. Congress (these laws are called the Stop Online Piracy Act and Protect Intellectual Property Act, henceforth to be referred to as SOPA and PIPA). I can't even begin to pretend that blacking out my humble little site would accomplish anything, but since a lot of my personal and professional livelihood depends on the internet, I suppose I can't ignore this either. For the uninitiated, if the bills known as SOPA and PIPA become law, many websites could be taken offline involuntarily, without warning, and without due process of law, based on little more than an alleged copyright owner's unproven and uncontested allegations of infringement1. The reason Wikipedia is blacked out today is that they depend solely on user-contributed content, which means they would be a ripe target for overzealous copyright holders. Sites like Google haven't blacked themselves out, but have staged a bit of a protest as well, because under the provisions of the bill, even just linking to a site that infringes upon copyright is grounds for action (and thus search engines have a vested interest in defeating these bills). I won't belabor the point much further, but I will link to Kaedrin's official stance on Intellectual Property, Copyright and DRM, a post I wrote a few years ago on my generalist blog that I think is still relevant. An expanded version of this post you're reading right now is also up at my generalist blog, along with some other links and thoughts on the matter. Feel free to stop on by. And if you're so inclined, perhaps your form of protest could be represented by a different kind of blackout. Regularly scheduled programming will resume tomorrow. 1 - Thanks to James for the concise description. There are lots of much longer longer and better sourced descriptions of the shortcomings of this bill and the issues surrounding it, so I won't belabor the point here. Beer Nerd Details: 5.8% ABV on tap. Drank out of a 0.3L glass on 1/7/11. 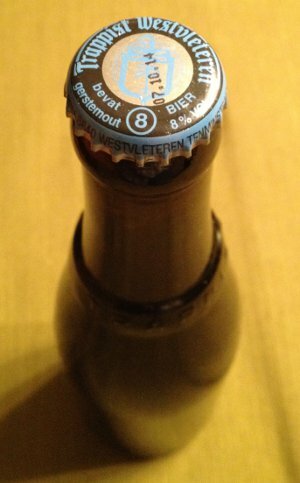 * Technically, the next beer on my list is Trappist Westvleteren 8, which is one of the least accessible beers in existence, but I'll skip it for a day or two, I think. A "pannepot" was a fishing boat based in the small Belgian village of De Panne. As the story goes, the men would go out fishing and their wives would stay home and brew up a strong, dark beer. I don't know how closely De Struise Brewery is following those historical recipes, but they call this beer their Fisherman's Ale, an ale brewed with spices. 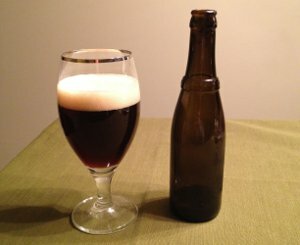 Struise's reputation is almost entirely a consequence of the Internet. "In the early days, it was impossible for us to sell beer in Belgium," Grootaert said. 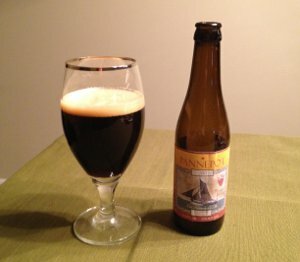 But after a RateBeer.com user in Denmark contacted Grootaert and tried his beer, Pannepot began circulating within the Danish beer-geek community, and its Web-savvy fans broadcast their approval to the rest of the world. 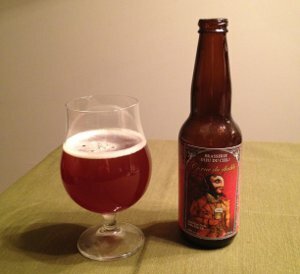 Beer Nerd Details: 10% ABV bottled (11.2 oz) Drank out of a goblet on 1/7/11. 2010 vintage bottle. Beer Nerd Details: 9.4% ABV bottled (22 oz bomber). Drank out of a tulip glass on 1/6/12. An epic idea, for sure, but it seems I've come on board a little too late in the process! Still, I'll check out that 12/12/12 beer for sure.